I have been a fan of Purex crystals but Purex have made them even better. Now in a liquid form that is more convenient and smells GREAT. Thanks to Purex, I got the opportunity to try the product in Fresh Lavender Blossom. I have been using the product for a week now and all of my towels smell great like they were just taken out of the wash. It is safe for all fabrics so you can freshen up any garment. 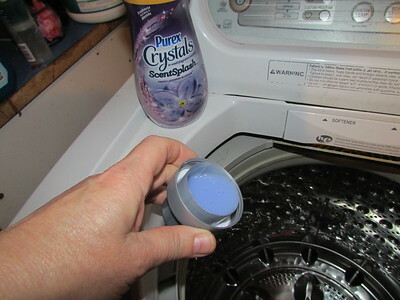 New Purex Crystals ScentSplash in-wash fragrance booster infuses your clothes with the power of liquid freshness. Simply add a little or a lot directly into your washer for scent that lasts months! Fresh Spring Waters- Wade into cool, enchanting waters and give your laundry and incredible just-washed freshness. Fresh Mountain Breeze- Capture the exhilarating moment of a crisp, fresh breeze. Fresh Lavender Blossom- Wander through colorful, sun-lit fields of lavender. Enter here to win a coupon to try the product for yourself. Open to USA only. Contest ends 4/15/14 @11:59 PM EST. Good Luck.